Looking for another easy recipe to add to your weekly meal rotations? 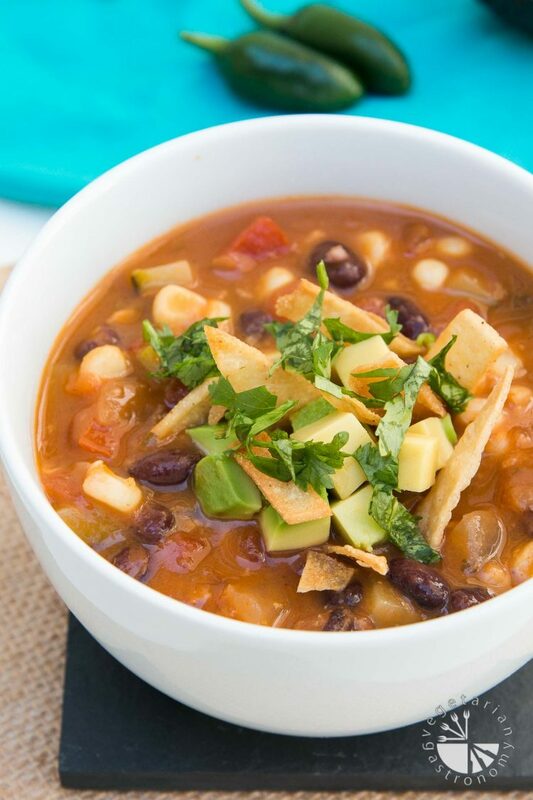 This Vegan Tortilla Soup recipe is healthy, filling, and family-friendly! No fancy ingredients…simple, yet delicious, making it the best tortilla soup you’ve ever had! Isn’t it awesome when you find that perfect meal to make for your family? 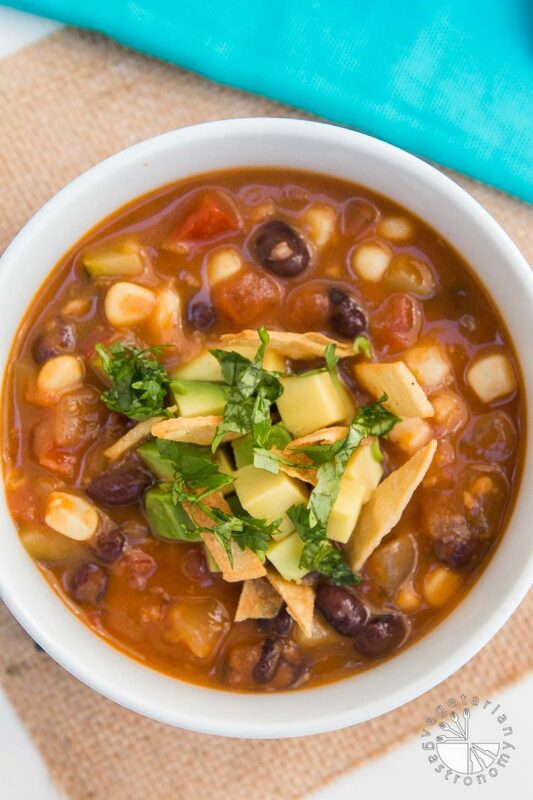 This Vegan Tortilla Soup is a one-pot, easy, complete, healthy, well-balanced meal. Even your kids will enjoy this dish. You will wan to make double the recipe, because everyone will be asking for leftovers the next day…AND it makes a great school lunch. Have I caught your attention yet? This soup is a favorite in our home. We make it at least 2 times a month, if not weekly. The base is a simple combination of vegetable broth, onions, garlic, fresh jalapenos, lots of cilantro, and a few basic spices. The flavor of the soup really comes from having the base ingredients simmer with all the fresh vegetables and black beans until fully cooked. 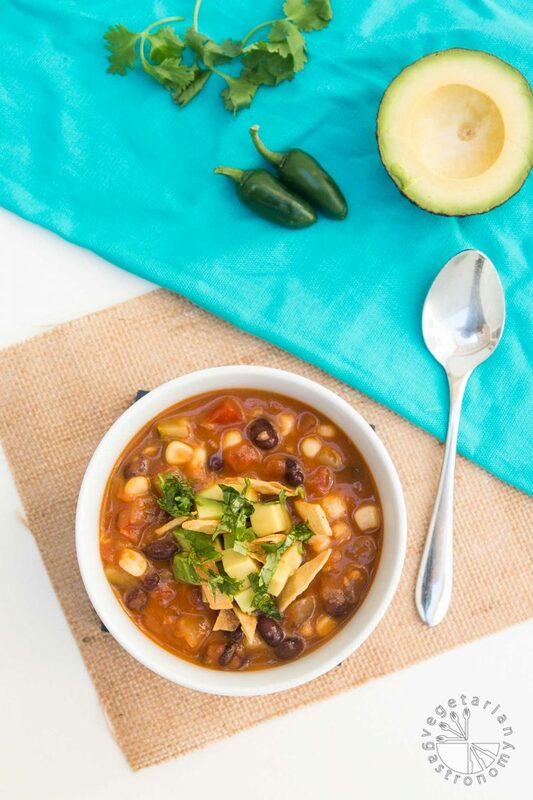 One of our favorite things about this vegan tortilla soup is how creative you can get with all the toppings. You can enjoy it as is, or take it up a notch by making a small topping platter of finely diced avocado, cilantro, jalapenos, freshly fried corn tortilla strips, and a few drops of your favorite hot sauce. Simply warm up the soup and let everyone customize with the toppings. You can even get your kids involved and let them cut the corn tortillas with a pizza cutter into any shape they want before frying or baking in the oven. If I’m short on time, I use my Chop Wizard to help prepare all the veggies ahead of time. After that, the soup requires very little attention while cooking. (On a side note – the Chop Wizard is AMAZING. If you’ve never owned one, you’re missing out. I love using it when I have a lot of veggies to chop. It dices or chops the veggies, all the same size and shape). For a baby or toddler version, simply blend this soup to your desired thickness. I did this with my kids when they were younger, served with a side of mashed avocado. 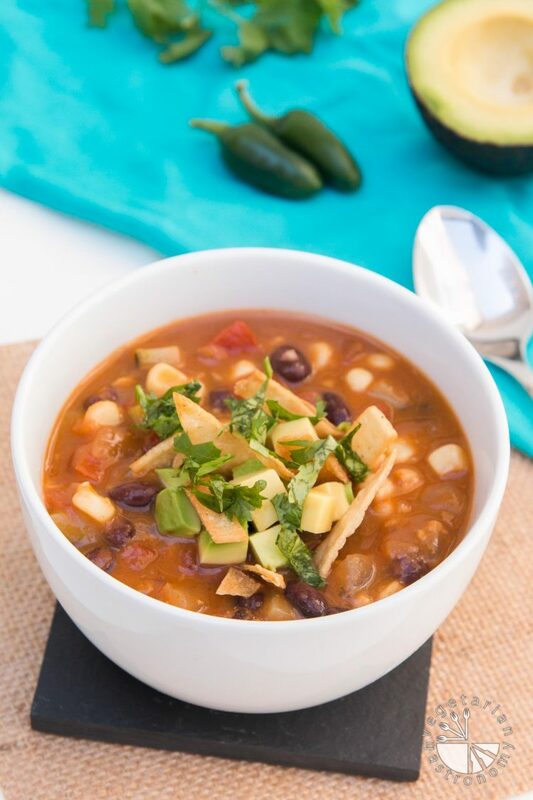 If you’re looking for a healthy, filling, tasty, family-friendly go-to meal, this Vegan Tortilla Soup recipe is the one! It’s easy and delicious, and hands down the best tortilla soup I’ve had. I’ve served it on several occasions as an appetizer when hosting dinner parties, and it’s always a huge hit. So try it out, and let me know what you think! Tag me on Facebook or Instagram, @vegetariangastronomy #vegetariangastronomy , I love seeing and sharing your re-makes! Heat 1-2 teasp cooking oil (avocado oil or grapeseed oil) in a large soup pot on medium heat. Add the onions and garlic and saute until tender (~1-2 minutes). Mix in tomato paste and cumin. Add a few drops of hot sauce if using. Add the vegetable broth, 1/3 cup cilantro, and a dash of salt. Mix and bring to a boil. Simmer for 15 minutes, uncovered. Add the tomatoes, beans, zucchini, jalapeno (if using), and corn. Simmer for about 20 minutes or until all the vegetables are tender (I typically check the zucchini to see when it's done). Season with salt/pepper to taste. Top with cilantro, avocado, jalapenos, and fresh fried corn tortilla strips. Add a few drops of your favorite hot sauce for additional spice. Enjoy hot! Vegetable Broth - I use Imagine low sodium Organic Vegetable Broth. I've used other brands before, but this one is by far my favorite. Prep Ahead Tips - Chop all the veggies ahead of time. Use tortilla chips instead of making your own. For Toddlers & Babies - Once the soup is done, blend it to your desired consistency. We have made this a regular in our house! It's so easy and tasty. I made a couple modifications, I add an extra can of beans, 4 cloves of garlic and 2T of smoked cayenne pepper to give it a bit of a smokey flavor. Delicious! That was really good. I had to leave the chilies out for the kiddo, but we added on the side :). Made my own broth this time, too! YAY! Glad you enjoyed this soup...I could probably eat this soup once a week and it's so filling! Hopefully you enjoyed the garnishes on top, minus the cheese of course =) I always leave out the chilis and hot sauce as well so my kids can enjoy it. I've always thought about making my own vegetable broth - how did you like it? The broth was very good, and I gave leftover for tmrw's soup which is nice. I used celery, carrots, potato, yellow onions, celery root, and a little garlic and parsley to make the broth. You've inspired me to make my own broth! Thanks! I already commented on this when I made it for the first time 5 years ago, but recently we had people over and I was looking to make something to go along with enchiladas. I cut everything up before hand and then made the soup maybe 30 min before dinner. It was a huge hit! Everyone was raving about it and my dad even asked that I make it one more time before I leave. There were different spice tolerances so it was nice that people could add more cholula to taste. I will definitely be making this soup again! THANK you Avani! Loved reading the feedback, and I'm so glad everyone loved this soup as much as I do! It's one of my favorites and I could eat it all week. Thank you for all the support and for trying out my recipes! I made this soup at least 5 times in the past 1 1/2 month! all my friends have been asking for the recipe! That's so great Avani! It's delicious and so healthy. Once you realize how easy it is to make it's just a matter of having a few things in your fridge. Thank you!! And thanks for passing along the recipe! You and my kids...both LOVE the crispy tortillas, especially when I make them fresh! Thanks Natalie! Yes exactly my feelings...always craved it and resturant versions always used chicken broth so I love this recipe! The spices are actually perfect for you (minus the jalapenos and hot sauce)...the rest of the flavor actually comes from cooking the soup veggies broth together themselves so it's right up your alley! It's raining like crazy here finally so this soup has been in the rotations in our house for awhile now =) And those toppings...ok now i want a bowl right now! Mmm, this sounds fantastic! I love a good hearty tortilla soup! Thanks Michelle! The toppings are so much fun and add extra complexity to it! Love this! It's vegan and gluten free...yipee! I bet the tortilla's give this soup a nice little crunch? Yes!! The fresh strips are my favorite part of the soup, and the flavors are awesome! I really love soups especially this time of year. This soup looks and sounds amazing! Thanks Stephanie. This is one of my favs because it's a complete well balanced meal! This looks so thick and hearty, I just want to dive right in. Great flavor combo and I love the crispy tortilla strips for texture! Thanks Lisa! The textures are all over the place on this one which is why i love it so much! We love tortilla soup over here! It's a regular rotation. My second is a soup fiend so we try and mix it in for him. Looks delicious and super hearty! Thanks sophia! I love it when kids enjoy soup! Awesome, thanks Hauke! You'll love it...let me know if you try it out! this soup is calling my name with extra avocado slices! Extra avocado slices for sure! Thanks Dixya! Love tortilla soup. It's time to make it again. Looks delicious! Yes!! I always make extra so I can have it again over the week. I hated not being able to have it at restaurants growing up because they had chicken broth in it. This recipe is delicious! I like to try your version Anjali:) I always like to try flavorful soup:) Today I am going to make this one! Thanks Uma! You will LOVE it...this soup is so delicious and easy to make. Let me know if you try it out! I've never tried tortilla soup, but your recipe has me excited to make some! Those ingredients are right up my street, and I love how you can customize each bowl with toppings. Your pics are making me drool! Oh you are missing out! Tortilla soup is delicious and this recipe is my favorite! It's very easy, and the toppings are so much fun! Let me know if you try it! Absolutely incredible taste! I fed it to my entire non-vegan family and they gobbled it up. I felt so satisfied that they all ate healthy AND enjoyed it! yay! that's awesome that they loved it! I always make double the batch for the next day too. Thanks so much for trying it out jaime! Aww thank you so much! I'm so glad you guys all loved it! I made it for a dinner party as well...so easy to make ahead of time and just serve and I love that it's packed with veggies and protein! Thanks so much for the great review! I love this soup so much. Do you think it would be okay to make it a day or two ahead of time? We are going out of town until Sunday evening and I want to have this for dinner Sunday night. I thought it might be easier to make it before I leave and warn it up when I get back. Absolutely, and thank you so much! This is one of my go-to as well and since it's such an awesome meal, i typically make twice the batch and enjoy it for 2-3 days. The flavors also end up marinating more together so it tastes even better made ahead of time. Enjoy!! Do you have to use avocado or grape seed oil ? Is olive oil ok? Nope...you can use any oil you like. Yes olive oil is fine. I like to use a neutral oil for the most part in my cooking depending on the recipe (so it doens't add flavor) which is why i recommend avocado, grapeseed, sunflower oil, etc...but any oil is just fine! Loved this soup, so easy, flavorful and healthy. Now this is gonna be my quick fix on a busy weekday! Thank you! My family loves it, so glad you do as well! This soup is incredibly delicious! And simple too!!! Will be making again and again, thank you! Thank you!! So glad you loved it...my entire family loves it! We make it a few times a month! This soup was SOOO delicious! I doubled the recipe and added smoked paprika (no jalapeños since my kids don't like anything spicy). I did add a splash of my MIL's homemade pickled serrano pepper liquid. Oh my, so delicious!!!! So glad I doubled the recipe because we have lunch for tomorrow. :) Thank you!!! awesome!!! and wow...homemade pickled serrano pepper liquid??? I need to make myself some of that! My kids aren't huge spice fans either so i typically add fresh jalapeno on top. And yes to doubling the recipe! Works wonders for leftovers. Thanks so much for the review! !